I'm often pretty terrible at picking up games I am interested in or just flat out playing them. I have my own backlog of sorts that I still need to work through, so what "Late to The Party" is going to be is just sort of my own late reviews of games that came out...really whenever ago. 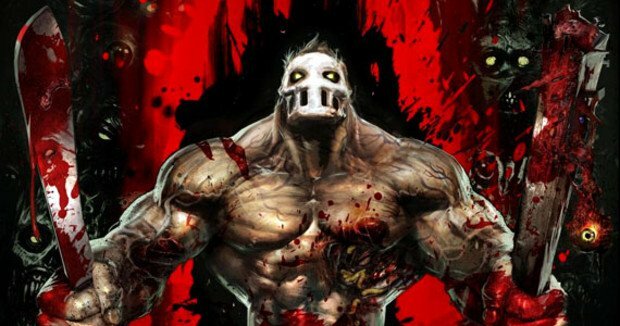 When Splatterhouse was first announced some time ago I got all sorts of excited, the original games were still classics in my mind when it came to favorite old school video game franchises. I still have fond memories of first sneaking away to my room with my older brother's copy of Splatterhouse 2 and playing it for hours. The games to me at that young were terrifying but also so interesting that I tossed my fears aside and pressed on, though later when it was time for bed I would have to fight imagery of the boss monsters in my head in order to sleep. To me Splatterhouse was like the older more mature version of Super Mario, you were simply a man who wanted to rescue a girl. I think that's what made the game so appealing, it was such a dark and twisted spin on a very familiar concept. I would revisit these games many times throughout my teens and would always wonder if out of all the games that were being revived if it this would be one of them...which it eventually was. I would search high and low after it was announced for information on it, would it be a reboot, would it be the same exact formula, what would they do? I remember watching the trailer and being relieved to see the overall tone of the game was still the same, you still played as Rick, still wanted to rescue your girlfriend and the only way you could do it was with an uneasy alliance with the "Terror Mask". I would eagerly away to see what the game would be like when it was finally released...and I was disappointed. It seemed like everywhere I went every review trashed the game, calling it boring, repetitive and a complete rip-off of every modern action game nowadays. Needless to say it took the wind out of my sails about picking it up. Months would pass into next year, I would always peruse through the gaming section of the Best Buy I work at and would always stop and having to read the back. Always wondering "Could it really be that bad?" Eventually due to other games coming out I forgot about picking it up until one day I happen to stumble upon one of the last copies we had in the store and saw it had dropped in price. Figuring what the hell I decided to pick it up and give it a go. What I found was a game that did not deserve all of the criticism it was being slammed with, what I really found was a brutal, fun, gory, simple and enjoyable modern day brawler that was a blast from start to finish. Does the game have problems? Yes, it definitely does, but as someone who doesn't need their games to always have top-notch production values and can enjoy simplicity I was completely satisfied. One thing I enjoyed about the game was that it finally gave me and what most Splatterhouse fans wanted, more story. Thankfully it doesn't go completely overboard but this time around we finally learn more about the Terror Mask, the antagonist Dr. West, Rick's relationship with his girlfriend Jennifer and more about the events that led to West Mansion being as f'd up as it is. As I said it thankfully doesn't go overboard, cutscenes are brief, well-done, and really help flesh out the motivation of the hero. Speaking of the hero I really enjoyed the almost symbiotic relationship that Rick and the Terror Mask have, the brief dialogue that the two share between the combat really give a welcome bit of personality. Speaking of personality I really have to commend the voice acting of everyone in the game, all the characters have appropriate voices and are all done really well, the big star of the show of course having to be the Terror Mask itself done by voice-acting veteran Jim Cummings. I was a little concerned that his constant one-liners and berating comments would grow tiresome towards the end but even in the games final stages I was still cracking a smile at it's cruel and unusual form of encouragement. The combat in the game is simply put, fantastic. It starts off really simple and I'll admit frustrating, but once you really get into it and upgrade some of your skills you get a great rush out of pulling off some epic moves. For example, breaking up a crowd enemies with a shoulder ram, singling out one to tackle and rip the arm off of, continuing to use said arm as a blunt object to take out another, then finishing it the last enemy standing by pummeling them until you can use one of the games "splatter-kills" to end their life by ripping their torso off. I loved it because while you did become this wrecking ball of destruction at the same you had to use some level of strategy to keep yourself alive. Simply rushing in and wailing on the light attack button won't work once really get into it. As I said the game does have its problems, the platforming segments are frustrating since they don't really let you know where to go and the load times can be bothersome. But not of that really mattered to me when I was clearing a room full of enemies with destructive grace. The game keeps up a brisk pace and keeps the combat flowing pretty consistently with not to much in the ways of downtime. Just enough for some dialogue and exposition between the Mask and Rick. The music also helps keep the flow of the game moving too, though I'm not the biggest fan of death metal the tracks used did set the tone really well for the game and added a level of excitement to the games set pieces and boss battles. I've never really typed a review before so I wanted to keep this somewhat short. In a nutshell if you were a fan of the original Splatterhouse games (which you do get the original 3 in the game! ), are looking for some gory brutal combat similar to MK, or if some of your favorite movies are Evil Dead and even Riki-Oh, you will probably find a lot to love in Splatterhouse. I know I did.